Music has the Musical Genius Aspiration and the Entertainer (Musician branch) career. There is a separate skill for each instrument; Guitar, Violin and Piano. To Mentor Others in Music for 15 hours, you need Level 10 skill in the instrument. Add a sim to your household, have them play an instrument, then select the Mentor social. Piper abilities work on all instruments and do not affect your sim. 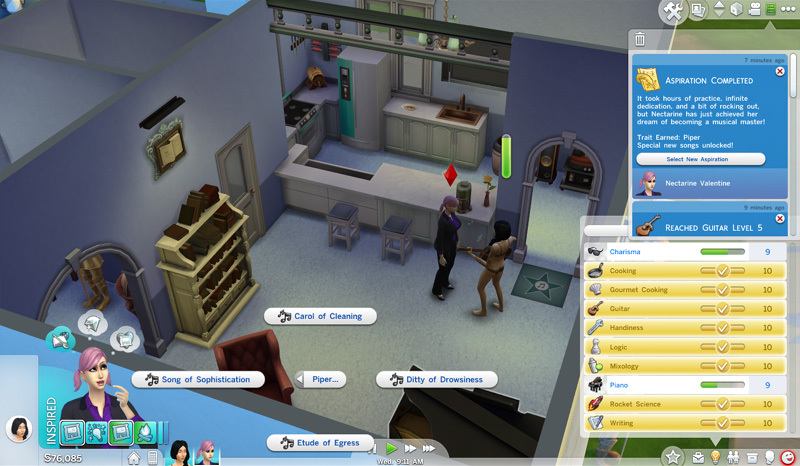 ♥ Carol of Cleaning – Makes sims perform a cleaning interaction. Just one. Useful, but not a free maid. ♥ Ditty of Drowsiness – Makes sims sleepy. ♥ Etude of Egress – Makes sims leave. ♥ Song of Sophistication – Changes sims into Formal attire. ♥ Music Lover – Gain moodlets for listening to and playing music. It takes a very long time to finish a song. If you stop the interaction, a Sheet Music will appear in your inventory, you can continue the song by interacting with it. You can license one song for each instrument at a time. As skill still raises while doing this, start as soon as it unlocks at Level 8 to progress Musical Genius 3 (Earn §1,000 from Licensed Songs). For info about the Musician career, see the Comedy page.